The artist Gita Hashemi’s transmedia practice spans nearly thirty years and encompasses works that draw on visual, media, performance, site specific and live art strategies. Focusing on historical and contemporary issues, her work explores social relations and the interconnections of embodied language with cultural imaginary and politics. Her recent projects include Passages, a series of live art performances and video installations that use embodied writing and reading to explore 18th-19th century texts written by travelers from the East to the West, Headquarters: Pathology of an Ouster, a multi-platform work focused on the 1953 US-UK coup d’etat in Iran; Ephemeral Monument, also a multi-platform work based on the literature of resistance in Iran between the coup and the 1979 Revolution; The Book of Illuminations, a book as installation that draws on self-narrative and idiomatic Farsi to comment on repetitive political and cultural patterns, Utopias In-Progress, a site-specific performance, video and installation about the effects of capitalism on the arts, and Post-Coitus, a netart piece transformed into a live performance addressing the psycho-sexual dimensions of colonial wars. Hashemi’s work has been exhibited extensively at festivals and galleries nationally and internationally. She is a recipient of Baddek International New Media Award for the CD-R Of Shifting Shadows, Toronto Community Foundation Award for the sound installation The War Primer, and American Ad Federation’s award for the book Locating Afghanistan. 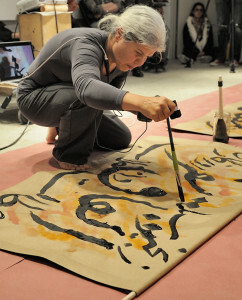 She has received numerous art grants from Canada Council for the Arts, Ontario Arts Council and Toronto Arts Council. She taught time-based art, “new media” and cultural studies at York and Ryerson Universities and University of Toronto, 1998-2009. An advisor for On the Move, Tanja Ostojić (*1972 Yugoslavia) is a Berlin based independent performance and interdisciplinary artist and cultural activist. She works predominantly from the migrant woman’s perspective, while political positioning and integration of the recipient define approaches in her work. Since 1994, she has presented her work in numerous exhibitions, festivals and venues around the world. She has given talks, lectures, seminars and workshops at academic conferences and at art universities around Europe and in the Americas.